The Historical Society of Sarasota County has two new programs beginning in December. BBBL – Brown Bag Book Lunch! This series of four get-togethers starts on Wednesday, December 17, 2014 from 11:30am to 1:30pm. Local authors will discuss their books and offer insights in the Crocker Memorial Church starting at 11:30am followed by a question and answer period. Then the group will have their BYOB brown-bag lunch on our serene Back Porch with beverages supplied by HSOSC. On December 17 Bea Hartman will illustrate chapter sites from her “Florida Treasures – 55 Great Sites on the National Register of Historic Places“. You will be able to purchase an autographed copy at the meeting. These events are free for HSOSC members and $5 for guests. Also new beginning in January, HSOSC is starting a History Book Club headed up by president Howard Rosenthal and new member Anita Palladino. 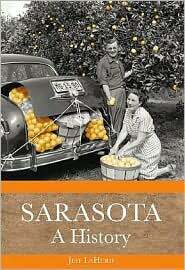 First book reading is “Sarasota A History” by Jeff LaHurd. These meetings will take place on the 3rd Thursday of the month at 1pm from January thru April in the Crocker Memorial Church.